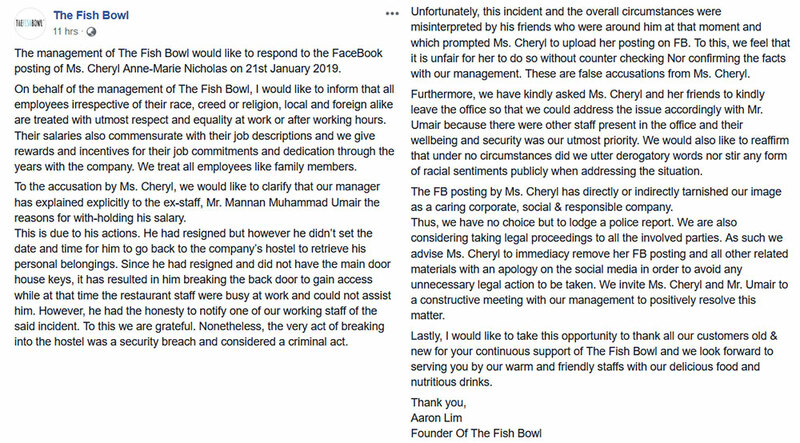 F&B chain The Fish Bowl have found themselves in the middle of a social media crisis after a Facebook user accused them of unfairly treating and abusing their ex-employee, who is also her friend from abroad. Wanting to control the damage, The Fish Bowl issued a counter statement on their Facebook page. Unfortunately, their own statement did not convince some of the commenters and I examine why. It’s never fun dealing with a social media shitstorm, especially if you’re a business that relies on the good graces of the web-savvy public and their invaluable perception of what your business means to them. 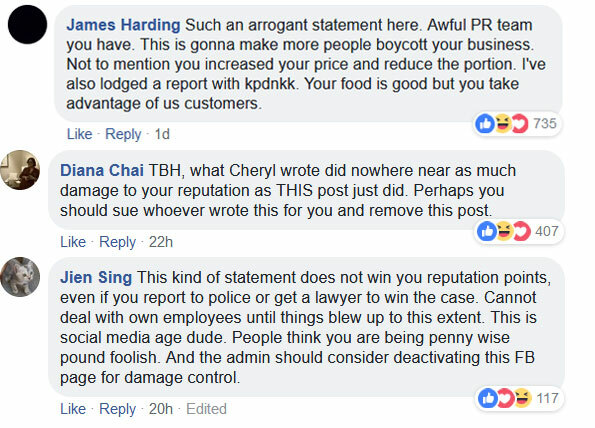 At the start of this week, yet another Malaysian business found itself embroiled in a sticky situation on social media. 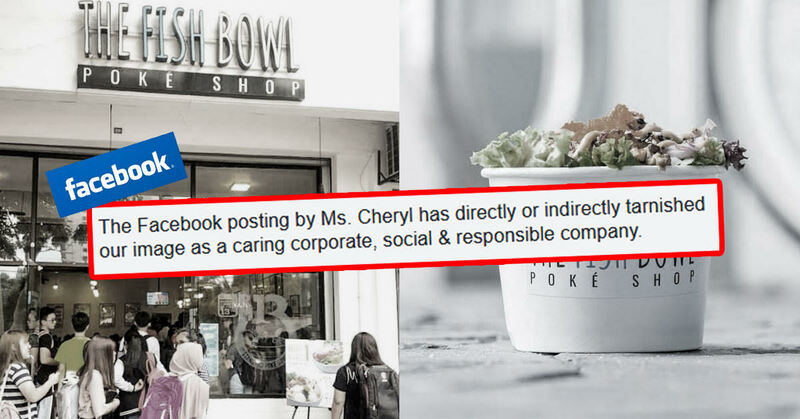 This time, popular poké bowl restaurant chain The Fish Bowl discovered itself facing damning accusations from one Malaysian Facebook user. With a public post on her personal account, she detailed the ordeal her friend had supposedly endured at the hands of The Fish Bowl’s upper management—his once employers. In the lengthy post, there were accusations of injustice, verbal abuse, discrimination, and story-twisting on the part of the owner and manager towards the ex-employee whose friend claimed to witness first-hand. In the moments following the post going public, the poster—Cheryl Anne-Marie Nicholas—received plenty of likes, shares and supportive comments, with public sentiment quickly swaying in favour of her and her buddy. This obviously meant bad things for the folks on the receiving end. You can also read the original Facebook post. A social media statement like that is meant to abate the anger and negative sentiments aimed at them, but they found the situation was far from defused. Obviously, they had aggravated people with their post, but why? Here we’ll look into the factors that made the Facebook post such a bad PR manoeuvre, and what they could possibly do to salvage the situation. Note: This analysis does not take into account which party is right or wrong, and should only serve as a case study for what is yet another local public relations fiasco. 1. Lacking of the human touch. Looking through slew of vehement responses on The Fish Bowl’s rebuttal post, it was clear that many were up in arms about the way the statement was written. It was called arrogant, and some saw it as threatening, especially the bit about using legal action should she fail to retract/remove her accusations. Here, The Fish Bowl did themselves no favours. Their choice of tone and words resulted in something that resembled a lawyer’s cease and desist more than it did an attempt to salvage their reputation. They may have decided to adopt a more formal tone in their statement, but it did give many the wrong impression. Screenshot of The Fish Bowl’s response. In that statement you’ll also there were hardly any signs of empathy, and no concession to there even being the possibility them being in the wrong (not labelling them as such—but when a person or group will not consider that possibility, it does come across as arrogant). The Fish Bowl’s statement didn’t have an apology. In fact, they demanded one. 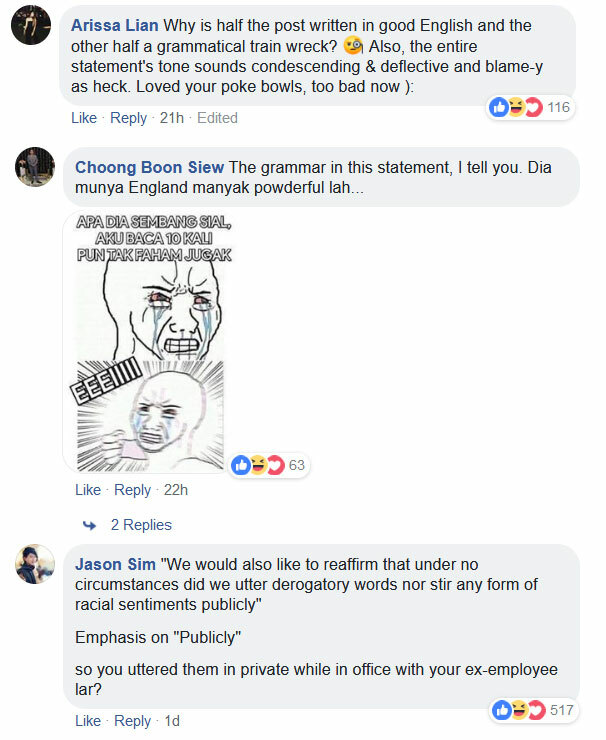 Compare this with the Irvins Salted Egg lizard incident that happened recently, and you’ll find a stark contrast between how relatable their apology statement was compared to The Fish Bowl’s. In their statement, Irvin’s profusely apologised for causing distress or discomfort amongst its customers, begged for forgiveness, and attempted to offer an olive branch to the wronged customer as well as others who had previously purchased their snacks. While I’m not saying The Fish Bowl should imitate them exactly, the point remains that having a bit more of a human, conversational and humble voice goes a long way in these situations. Just compare the reactions and comments between the two posts for proof. You can argue that Irvin’s was already proven guilty of delivering a faulty product, and therefore had no choice but to sound as apologetic/humble as possible. The crux of the matter here is that statements like these should always come worded like one human talking to another on the same level, with due respect. 2. Did not fully clarify what they were trying to say. An elementary error more than anything, The Fish Bowl left an incredibly obvious weak point in their statement—something their detractors saw fit to exploit in their ongoing salvo on the F&B chain’s social media. Highlight of The Fish Bowl’s response. While in most circumstances this would seem fairly harmless, it’s important to remember that this was written in response to heavy criticism and fierce public backlash over something that could only have been witnessed by a handful of people, i.e. that it was in private. So when it came time for people to read through and inevitably pass their comments, of course they hopped on the opportunity to deride and poke fun at that bit of the post, regardless how sincere it might have been meant. Add to this the improper grammar, unstructured arguments (social media users dislike reading long posts), and poor vocabulary use littered throughout the statement, and The Fish Bowl made themselves easy pickings. Again, this error was elementary and could have easily been avoided had they just paid more attention to the words and semantics they used. 3. There was no mention of positive change. Finally, it was worth noting that the post also failed to reassure their audience that their team were taking steps to address the problem. They didn’t say that they were about to perform an internal investigation, nor did they even at least inform their readers that they’d make sure this would never happen again. Sure, they made a claim that behaviour of the sort was unwelcome on their grounds, but such words are nothing more than lip service in today’s sensibilities. With these kinds of statements, it’s always a good idea to try convincing your target audience that you’ll at least attempt to improve conditions in your establishment, if accused of such. Even if not all of them believe you, announcing your intent to make things better is always a move worth making. They did invite the original poster Cheryl and her friend for a sit-down to go over details, but really, they could have and should have offered to conduct an internal audit into workplace practices. Despite it only being a day or two since the whole fiasco began, things move extremely fast in today’s online world. And judging by the look of things, The Fish Bowl team should prepare to face up to more of the same type of backlash currently being thrown their way. Why? Because everyone loves an underdog. For as long as the sentiment of corporate versus individual remains, the guys running The Fish Bowl will continue to face an uphill battle in winning back support and regaining public likeability (again, all this is ignoring the debate of who is right and who is wrong). So moving forward, the wisest step they can possibly make at this juncture is to issue another statement—this time with a more sincere and apologetic tone—to counteract the unsavoury aftertaste left by their first one. They’re not short of references either, with Uber’s Dara Khosrowshahi’s public apology or Tony Fernandez’s video statement good starting points. Additionally, it would also be smart for them to reveal any evidence of their innocence to the public as quickly as possible. Knowing how quickly public perception can change, any bit of information that could help balance out the story from both sides and help them gain back some goodwill should be released right away. Lastly, The Fish Bowl really ought to also be more deliberate in their PR statements and responses. There is no value you can place upon having a good reputation in the public sphere, and if that means needing to shell out a bit extra for professional consultation, then so be it. We featured The Fish Bowl’s business in an article recently. Click here to know more about the team behind the business. The opinions expressed in this piece are the author’s own, and may not necessarily reflect the views of the publication.